All our staff are fully trained and vetted. They have to supply references and undergo the completion of an independent Safeguarding Authority (ISA) check as well as a Disclosure Barring Service check. We are regulated by the Care Quality Commission and have regular inspections from them. At Shotover Kilns, we have a dedicated in-house training office with experienced, specialist in-house trainers. We teach the Care Certificate. The Care Certificate is an identified set of standards that health and social care workers adhere to in their daily working life. The Care Certificate gives everyone the confidence that these workers have the same introductory skills, knowledge and behaviours to provide compassionate, safe and high quality care and support. After training, then the Carer will ‘shadow’ experienced colleagues. Only when the Carer is considered experienced enough themselves, will they be given their own Clients to look after. 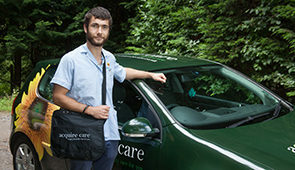 Our Carers are fully monitored and supervised throughout their career with Acquire Care. Often they will complete further courses at Shotover Kilns to increase their expertise.